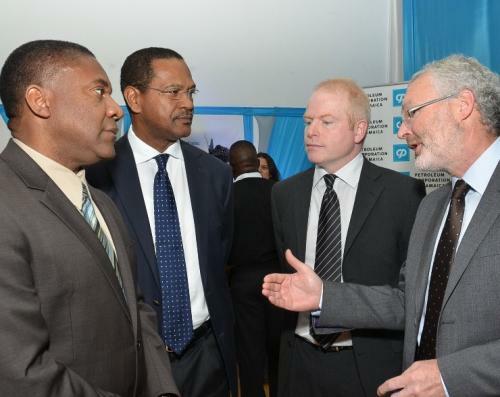 Tullow Oil PLC has re-affirmed its commitment to its Oil & Gas exploration programme in Jamaica following a series of meetings between company executives and Minister of Science, Technology, Energy and Mining, Phillip Paulwell. Minister Paulwell and a delegation, which included the Petroleum Corporation of Jamaica’s (PCJ) Chairman, Christopher Cargill and Group General Manager, Winston Watson recently visited (May 18-22) Tullow’s London and Dublin offices to discuss the status of the Production Sharing Agreement (PSA) which Tullow signed with the PCJ in November 2014. The PSA granted Tullow licence to undertake oil and gas exploration in Jamaica’s offshore blocks. During the meetings, the Minister raised concerns about the potential implications of the recent decline in oil prices for Tullow’s exploration activities in Jamaica; and questioned whether the changing economics would negatively impact Tullow’s commitments under the PSA. However the Tullow Team, which included two Board Members, re-iterated the company’s commitment to its contractual obligations and to working with all relevant stakeholders in Jamaica. In addition, Tullow emphasized its long-term approach both to exploration and the countries in which it works; stating that while the oil and gas industry tends to be cyclical, this is a good point at which to be seeking medium and long-term exploration prospects. Ian Cloke, Tullow’s VP New Ventures Business stated: "It was a pleasure to meet The Honourable Minister and the PCJ delegation in our London Office and we look forward to working closely with The Ministry and the PCJ to complete our agreed work programme". In response Minister Paulwell thanked the Tullow Executives for the assurances and restated the commitment of his Ministry and the PCJ to ensuring that the project moves forward according to schedule. “I am satisfied that the project is still on course and I look forward to the full determination of Jamaica’s oil and gas prospectivity,” he said. The Jamaican delegation was also given a technical update on the bathymetric survey currently being conducted in Jamaican waters under the terms of the PSA. The surveys are part of the exploration phase of the agreement which involves geological and geophysical studies, environmental assessments and the acquisition of seismic data to assess the presence of oil and gas underneath the seabed. If these evaluations are favourable then Tullow can elect to proceed to the next phase of the agreement which will involve decision making about drilling exploratory wells. The exploration phases of the PSA can last up to 7.5 years.